CANADA'S SINGLE-PAYER health care system has many American fans. 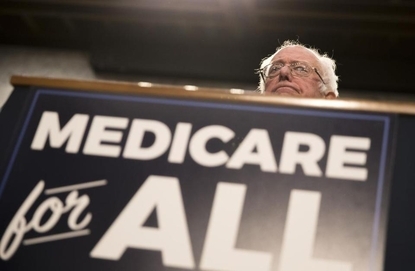 Senator Bernie Sanders announced a "Medicare for All" plan in Washington on Sept. 13. Vermont Senator Bernie Sanders has long advocated switching to a single-payer model — "Medicare for all," he calls it — and has sponsored legislation to bring Canadian-style health coverage to the United States. Among the bill's numerous backers is Massachusetts Senator Elizabeth Warren, who says adopting a Canada-like system will "give every single person in the country access to high quality health care." More and more Americans appear to believe that. In a September poll for Politico, 49 percent of respondents said they favored a single-payer system, under which "all Americans would get their health insurance from one government plan." Over the years, single-payer health care in the Canadian manner has been hailed by everyone from Nobel laureate Paul Krugman ("the American way is wrong, and ... we should switch to a Canadian-style single-payer system") to Donald Trump ("the Canadian-style, single-payer system ... helps Canadians live longer and healthier than Americans"). The US Conference of Mayors has endorsed it. Maine's state legislature has too. But as many Canadians can attest, the reality of single-payer doesn't live up to the hype. It's a great system if you're healthy and don't need a doctor. It's not so great if you're sick and looking for prompt attention. When it comes to delivering medical care in a timely fashion, Canada's system is inferior. And according to two reports released this year, it's getting worse. In February, the Canadian Institute for Health Information published "How Canada Compares," which matched the Canadian health-care experience with that in 10 other industrial democracies. Drawing on survey data compiled by the respected Commonwealth Fund, the institute noted that "Canadians continue to report longer wait times for doctors, specialists, and emergency department visits than their peers in other countries." Under single-payer, all Canadians are entitled to "free" health care and aren't billed when they go to the doctor or undergo a medical procedure. But doctors' appointments are a limited resource. Like all goods and services that aren't infinite, they must be rationed — if not with money, then with time. And so Canadians wait. In the Commonwealth Fund survey, only 43 percent of Canadians said they were able to get a same- or next-day appointment to see a doctor or nurse the last time they were sick. That put Canada dead last among the 11 nations studied. Communication with doctors is harder in Canada too. When you contact your primary care physician's office with a medical concern, patients were asked, do you generally get an answer the same day? Only 59 percent of Canadians said yes — again placing last among the countries surveyed. And when they need to consult or be treated by a specialist, the picture is even bleaker. Most Canadian patients, 56 percent, have to wait longer than four weeks for an appointment to open up. The international average is 36 percent. The average is even lower in the United States: Only 24 percent of US patients must wait so long to see a specialist. According to the Vancouver-based Fraser Institute, Canadians are waiting longer than ever to be seen by a specialist or to begin a needed medical treatment. 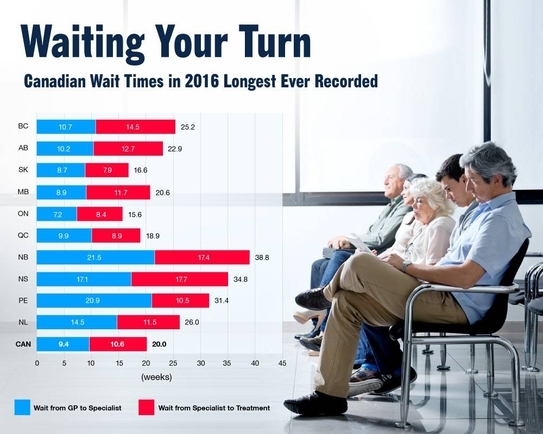 Meanwhile, the Vancouver-based Fraser Institute has released "Waiting Your Turn," its annual study of Canadian health-care wait times, based on a survey of physicians in 12 medical specialties. The institute found significant variations among provinces and medical fields, but the overall picture was grim. The median waiting time for medically necessary diagnostic or surgical procedures is now 21.2 weeks. That is the longest wait ever recorded in the survey's 24-year history — 128 percent longer than in 1993, when the wait for specialist care was just 9.3 weeks. Canadians even wait for weeks to get an MRI or CAT scan — something Americans can usually access within days. Once Canadians receive medical care, they generally rate it highly. But many, unable to get that care in a timely manner, head over the border. That "safety valve" is the real reason the Canadian system works as well as it does, argued Dr. Martin Samuels, a neurologist at Boston's Brigham and Women's Hospital, in a 2014 essay. For Canadians who can afford it, America's top-flight medical facilities are just a quick drive or flight away. Last year, more than 63,000 Canadian patients went abroad for medical care. No one disputes that there are serious problems with the US health care model, especially its high cost. Piling on vast additional layers of government control won't fix those problems. Canadian-style single payer is a wonderful system for those who enjoy waiting. But if you're in a hurry, or if you're sick, "Medicare for All" is the wrong prescription.